Your iPhone 4S gives you a third option for downloading apps. In addition to getting and installing apps on your computer and on your iPhone, you can use the Automatic Downloads feature. After you switch on the feature by tapping Settings→Store, all apps you buy with iTunes on your computer or buy on other iOS 5 devices will automagically appear on your iPhone 4S as well. To use the App Store on your iPhone, it must be connected to the Internet. And, if you obtain an app on your computer, it isn’t available on your iPhone until you sync it with your computer — unless you’ve turned on Automatic Downloads. Downloading an app is simple. When you find an app you want to try, just click its Get App or Buy App button. At that point, you have to log in to your iTunes Store account, even if the app is free. To change how your apps are presented, click one of the three icons just to the left of the search field and select from Grid view, List view, Album list view, and Cover Flow view. Also note the two buttons below the icons, which say Apps and Genres. 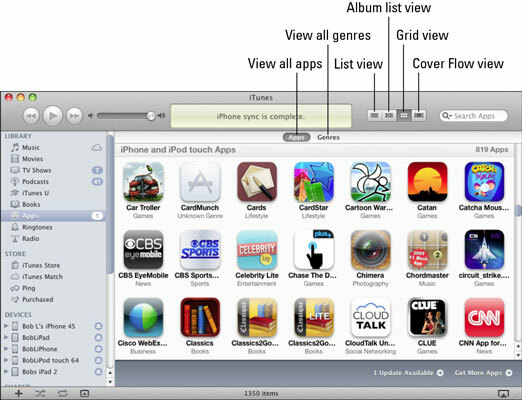 These provide two additional ways to look at your collection of apps.